Nikon D810 & 4K Sony Camcorder & 45surf Achilles' Odyssey T-shirt Photos Taken by the Nikon D800E! She (The d800E) Was Jealous, But I still Love Her! The 45surfer bracket setup for simultaneous stills and video (Nikon D810 + 150-600mm Tamron Zoom Lens for Nikon + the new 4K Sony FDR-AX100/B 4K Video Camcorder) allows me to shoot 4K video alongside 36mp stills of the Surf Goddesses! Will be using this setup at the Vans US Open of Surfing in late July in Huntington Beach (Surf City USA! ), and the Hurley Pro at Trestles in September! This power was simply inconceivable a few short years ago! 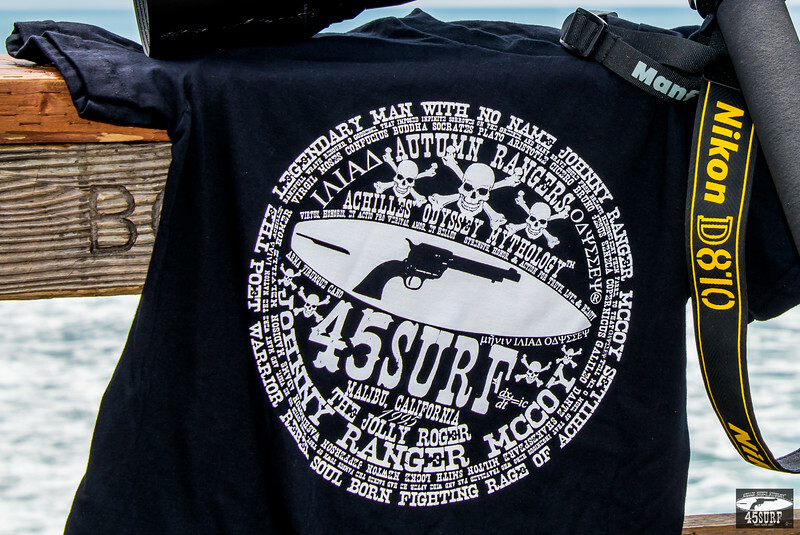 There was a lull so I shot some of the 45surf t shirts and 45surf hoodies too! Fall is around the corner when I sleep in my hoody every night as the Malibu Canyons nights get cold! JK, I could shoot the bikini models with a Canon 5D MK3 even and they'd still look good. Shown with the Tamron SP 150-600mm F/5-6.3 Di VC USD Lens for Nikon ! For shooting Alana Blanchard & the surf goddesses at the Van's US Open in a couple weeks! Nikon D810 + Sony FDR-AX100/B 4K Video Camcroder Photos Taken by Nikon D800E! She (the D800E) Was Jealous, But I still Love Her!